In the course of researching for a recent piece on Whitechapel and representations of horror and place, I necessarily ended up reading a huge amount of work on television horror. In tandem with this, I found my Twitter feed exploding with Tweets from people posting about the BBC one-off drama Ghostwatch, which was aired in 1992. Many of these were being retweeted and shared by the @ghostwatch Twitter feed and included responses from viewers watching the programme for the first time, those who were re-watching it, and people sharing their other thoughts and opinions on the controversial drama. Why, I began to wonder, was Ghostwatch still prompting such discussion over twenty years after it was aired? How does it still have the power to provoke such vivid memories or feelings in those who watched it back in 1992 or who are discovering it for the first time now? For the uninitiated, Ghostwatch was screened on BBC1 in a slot called Screen One, which broadcast drama shows on Saturday nights. 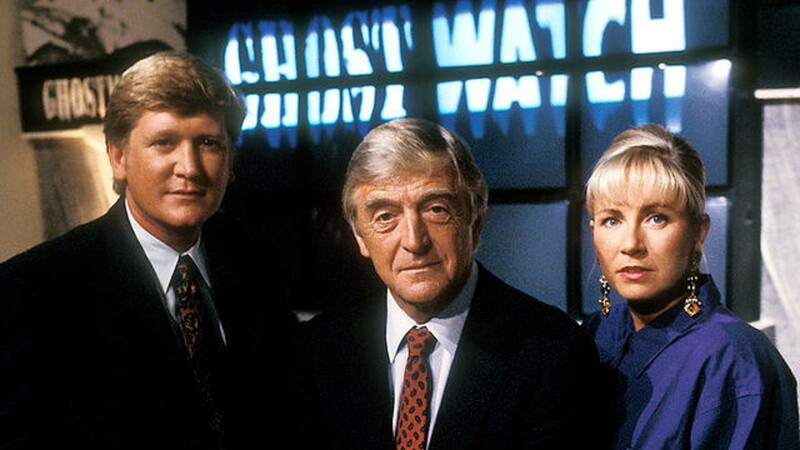 Ghostwatch was shown on Halloween in 1992 in its first and only BBC broadcast. Written by Stephen Volk and directed by Lesley Manning, Ghostwatch occupies a unique and interesting place within TV history for a number of reasons. The show was advertised and trailed as a live broadcast investigating nationwide claims of paranormal phenomena. The programme was, in fact, an elaborately staged drama, written by horror specialist Stephen Volk and pre-recorded months earlier. Ghostwatch was presented by Michael Parkinson and real-life husband and wife television presenters Mike Smith and Sarah Greene appearing as themselves in a completely scripted horror drama in which one of them apparently dies at the end. This added to a sense of authenticity and realism for the viewer who was encouraged at all turns to believe that the show was real and was happening in real-time. Whilst Sarah Greene and Craig Charles were on location, interviewing locals about spooky goings-on and observing strange phenomena, Parkinson and Smith remained in the studio, interviewing experts and appealing for the public to phone in to report unusual events or sightings. Events become increasingly more intense, with apparent sightings of the ghostly Mr. Pipes in the house where Sarah Greene is with the family as well as other strange experiences whilst the story of the ghost’s origins (hanging himself in the space under the stairs and subsequently being eaten by his cats) is pieced together from ‘viewer phone calls’ and the events in the house. The show ends with Sarah Greene entering the haunted space under the stairs and presumed dead, the television studio destroyed by poltergeist activity, and Michael Parkinson turning to the camera, apparently possessed. The broadcast prompted outraged complaints that the show had frightened viewers and, once the hoax was revealed, more complaints ensured regarding the fact that the BBC had duped the audience. More serious were accusations that the show had contributed to several suicides in young people after its broadcast. The reactions ranged from one person who thought it could have been a lot scarier to a woman viewer who demanded recompense from the BBC for a pair of jeans because her husband was so terrified he had soiled himself. None of us could have anticipated the scale or diversity of its impact on its audience. Having viewed Ghostwatch on its original screening, it is hard now to articulate the response that it provoked in me. As an 11 year old watching at home on Halloween, and being slightly naïve with regard to how the media worked, the sense of fear and dread that the show prompted were very palpable and real. Of course, reviewing it now with the benefit of age and greater knowledge of television convention, makes it easy to laugh at the things which once frightened countless viewers. The ending, for example, makes clear that the show is a work of fiction but, by the time it ends, the viewer has already been left confused and, presumably, scared by what has come before. it is clear that the strong audience response Ghostwatch received at the time was due less to its dubious credibility as a factual broadcast than to the way that it tapped into audiences’ desire to be fooled, to be tickled by even the slightest possibility that a live broadcast could really go out of control. Halloween, 1992: I was 13 years old and staying over at a friend’s house. As devotees of all things supernatural, we were excited because BBC1 was showing a programme called Ghostwatch. […] The show began in an innocuous – if not downright vapid – manner but, over the course of ninety minutes, built to a climax that had my nerves jangling like the Polyphonic Spree’s tambourine section. the closeness between horror and the familiar could in fact be taken too far for some viewers. Of course, the 1980s was also the decade which saw the introduction of home video, and the domestic reception of horror became more commonplace thanks to this development in film exhibition and distribution (Wheatley 2006:87). Now, over twenty years on from Ghostwatch its place within TV history and the TV studies canon is relatively marginal. This may be related to a general reluctance to acknowledge the genre of horror television, related to debates about whether true horror can ever be shown on a medium which is associated so closely with family viewing. Indeed, as Matt Hills suggests, when Ghostwatch is discussed it can only be talked about if it is elevated to a position of cultural value which makes the otherwise problematic genre of television horror more culturally acceptable. He points to the show’s DVD release through the BFI’s ‘Archive TV’ label in 200l; “Even Ghostwatch takes on the distancing patina of ‘TV history’, having been commercially released ten years on from its first and only BBC broadcast” (Hills 2005:121). However, it is only now that interest in the show is really starting to re-emerge. A retrospective documentary (Ghostwatch: Behind the Curtains) based on the film’s lasting impact has been in production since late 2007 and released in 2013, and is backed by many of the film’s original cast and crew. 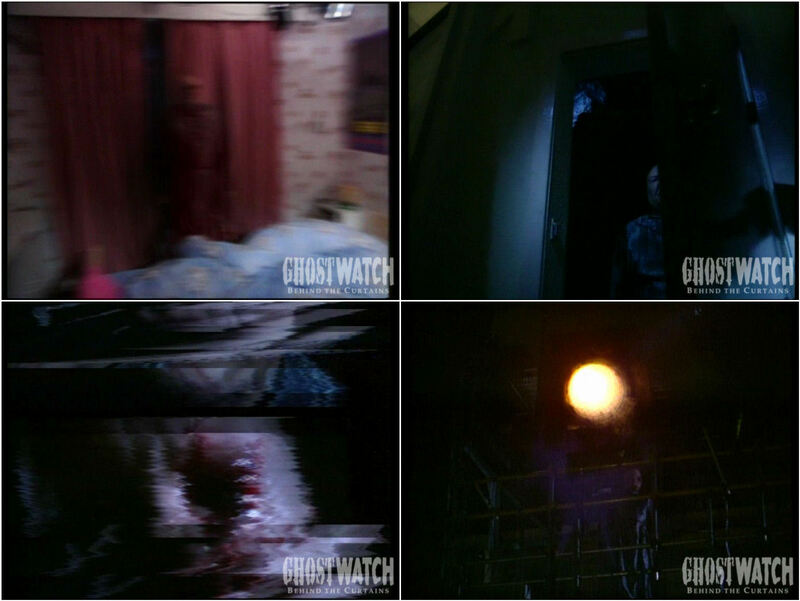 On October 31st, 2008 (exactly sixteen years after the original film was originally broadcast), the Ghostwatch: Behind the Curtains blog was launched. In December 2008, a link to the official Ghostwatch: Behind the Curtains forum was also added. It is certainly this documentary this has helped to introduce the show to a new audience. Furthermore, the creation of the documentary highlights a willingness by many to return to a programme which had a profound impact upon its viewing audience and which proved so controversial that, not only have the BBC never repeated it, but they have almost refused to discuss or comment on it at all. I strongly recommend tracking down the show and giving it a watch. 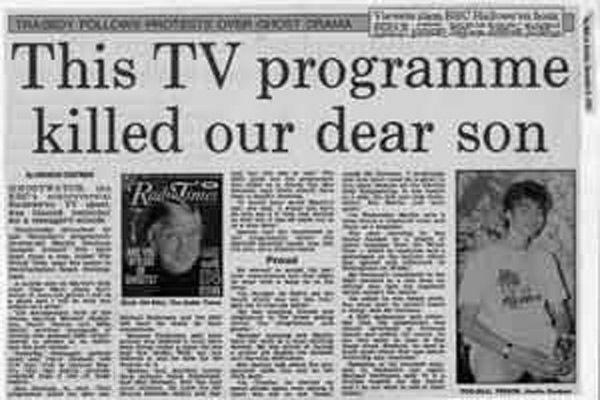 You may find the programme has dated – I don’t think it has. The presenters may be less recognizable, some of the fashion styles may look silly, but given the current climate of reality television, generic blurring, and lines between reality and fiction being eroded, Ghostwatch stands as a televisual piece of work which deserves its place in the study and understanding of TV horror. This entry was posted in Television by rebeccawilliamsblog. Bookmark the permalink. Senior Lecturer in Media, Culture & Communication Studies at University of South Wales.